Founded in 1887, Quincy Tennis Club is one of the oldest, private tennis clubs in the country. 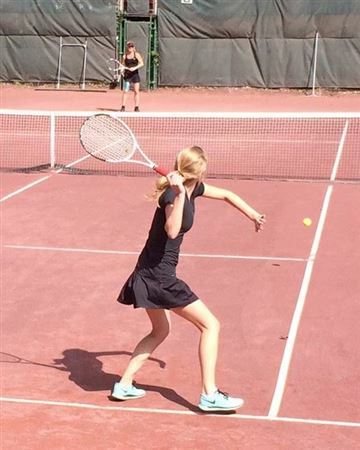 With five, brick-red clay courts and clubhouse facilities that include a spacious viewing porch, separate rest rooms with showers for men and women, soda machine and refrigerator, the club is the finest outdoor clay court facility in the Boston area. Our active members participate in yearly Tournaments, Juniors Program, Adult Clinics and Round Robins as well as celebrating an Opening Cookout with New Member Tourney and an Annual End of Year Party in October. There are a limited number of private memberships available for Families, Men, Women and Juniors. 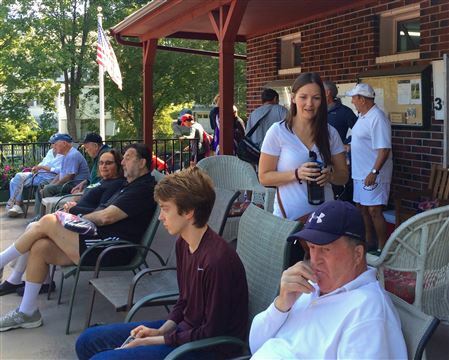 Prospective members apply to a Membership Committee and, if approved by the Board of Governors, are placed on a short waiting list which is currently running no more than one year for the yearly memberships.To learn more about the Quincy Tennis Club, see the information in the FAQ link to the left. If you love tennis, consider applying for membership now!!! Hosted, this year, by Hingham, the weather started out cloudy but eventually cleared as Quincy started a valiant come-back. Late afternoon victories put pressure on both Cohasset and Hingham but, alas, Hingham’s lead held and they took the cup! Thanks to all of our friends and fellow players at Hingham and Cohasset for a great challenge and fun time. As usual, food, fanfare, friendship and fun were in abundance. Congratulations to Hingham and to ALL the QTC players who teamed to make the day a great tennis event. An email about the clean-up was sent to all members. Members who participated and ran in memory of Emily Zarnoch: Paul Berrini, Jim Rougvie, Sharon Napier, Pat Rossetti(missing), John Zarnoch, Kathleen Torraco, Kathy Meade, Helen Mao, Skylar, Andy Nelson, Rich Griffin, Phil Murphy. Nice Job, Team! Helen Mao medaled by coming in 3rd in her division – Congratulations! THANK YOU to all members who attended and voted! Members were treated to a great day of food, friendship and exciting matches, Sept-15th. Congratulations to all of the winners and thanks to all who participated. Were Great! Thanks to everyone who came out to watch and enjoy the day! The Family of Dr. Philip Maloney wrote a very nice letter to QTC in his memory.